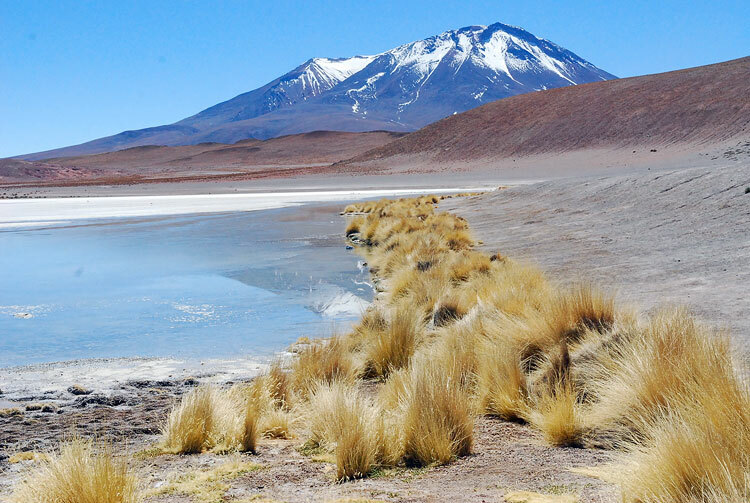 Andean Ichu grass along the shore of Laguna blanca. We begin in San Pedro de Atacama - the driest place on earth. 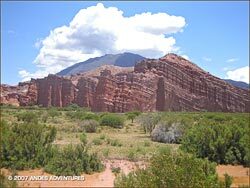 As we approach San Pedro we will have views of the Cordillera de la Sal and its magnificent reddish clay and salt mountains. We will hike in the Valley of the moon, the Valley of Death and the Kari Gorge, a narrow canyon formed by water erosion and surrounded by enormous salt walls. 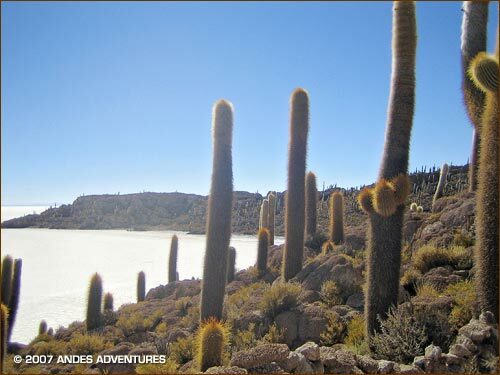 We drive across the highlands to visit Tiwanacu (also known as Tiahuanaco), and from there continue to Lake Titicaca. At 12,500' (3810 m) Lake Titicaca the highest navigable lake in the world. 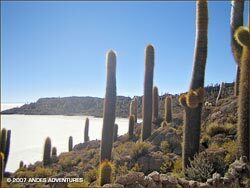 We arrive in Copacabana on the Bolivian side of the lake. 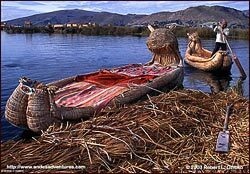 In Inca mythology, Manco Capac and Mama 0cllo, children of the Sun, emerged from the depths of Lake Titicaca to found the Inca Empire. With imposing snow-capped peaks along its far shores, the vast blue lake with its sparkling sapphire waters is one of the Andes' most enchanting scenes. (60% of the lake lies within Perú and 40% in Bolivia). The following day we take a boat to the Island of the Sun for a hike around the island.